Brooklyn-based design company West Elm will soon offer rentable bedding through a partnership with Rent the Runway, Inc.
For those unfamiliar, Rent the Runway is an online company that’s pioneered clothing rental over the past decade, allowing shoppers to enjoy high-end fashion at a discounted price. Now, the company is diversifying its brand by collaborating with furniture and design company West Elm. 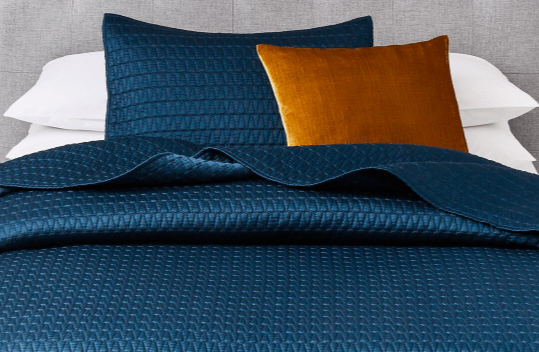 Starting this summer, consumers looking to spruce up their bedroom decor will be able to rent a selection of seasonal West Elm textiles. The bedding will be available through Rent the Runway’s website where shoppers may select a “bedroom bundle” or “living room bundle” curated by West Elm designers. The bedroom bundle is comprised of a quilt, coverlet, throw or blanket, decorative pillows, and shams, while the living room bundle will include decorative pillows or a throw. This is a monumental moment for Rent the Runway and the sharing economy as a whole. We know that clothing is often a vehicle to help people feel confident and expressive, and this new partnership will unlock that feeling through home decor. A sneak peek at a Rent the Runway bedroom bundle designed by West Elm. Renting a bundle is just like renting anything else through Rent the Runway’s online service. Each bundle is considered one item, and the duration of your rental (plus the ability to swap out styles) depends upon the subscription you purchase. All told, there will be 26 curated bundles available, giving Rent the Runway subscribers a slate of options and styles. Selections are presented in cotton, flax linen, velvet and silk, and come in an assortment of colors. Would You Rent A Bedding Bundle? From the early days of Rent-A-Center to the modern age of IKEA, several companies have experimented with furniture leasing over the years. In fact, furniture rental service Feather partnered with West Elm just last year, offering shoppers the chance to rent entire living room and dining room sets. Now that Rent the Runway and West Elm are set to let you lease pillows and blankets, I can’t help but wonder — is everything for rent? Well, recent reports examining the financial success of the clothing rental industry suggests that the market is rapidly growing. Coherent Market Insights, for example, forecasts that the online rental market, which yielded $1.01 billion in 2017, is expected to generate $1.85 billion by 2023. However, the recent West Elm/Rent the Runway partnership might strike a decidedly different chord with its focus on bedding. 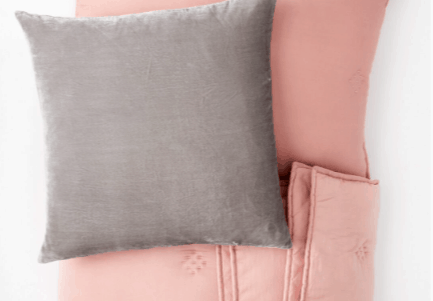 A Rent the Runway bedding bundle curated by West Elm. For some, the idea of “sharing” bedding products might not be as favorable as sharing a blouse or an end table (we do sleep on them, after all). Personally, I’m on the fence as to whether or not I would rent bedding products. I drool on my pillows, and often wake up to find mascara all over my favorite sheets. And while I know items are thoroughly cleaned before being rented, there’s just something more intimate about bedding, in my opinion. However, president of West Elm Alex Bellos asserts that rentable bedding bundles offer consumers the chance to explore new design ideas, and “each of [their] 26 curated home bundles encourage subscribers to translate their playful and bold style to decorating.” So, folks looking to experiment with home decor, but aren’t yet ready to commit to a specific style, might really benefit from a service like this. Both the bedroom and living room bundles by West Elm will be available to Rent the Runway subscribers starting this summer. Meanwhile, promotional in-store events hosted by West Elm are already well underway.